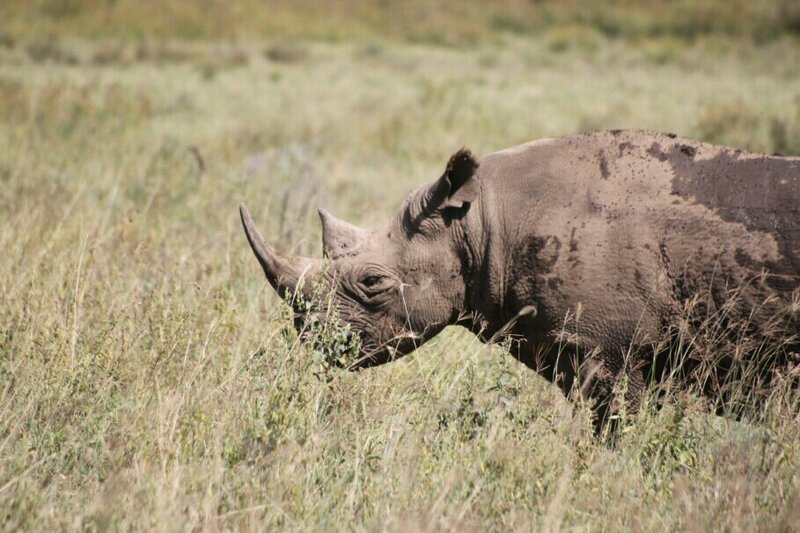 We finally had to leave Samburu and all the elephants, but our next stop was Nakuru where we expected to see rhinos. Instead of flying, we opted for the cross country drive. Both Elephant Bedroom and Mbweha are run by the same company so they arranged for a driver. It was an interesting drive. 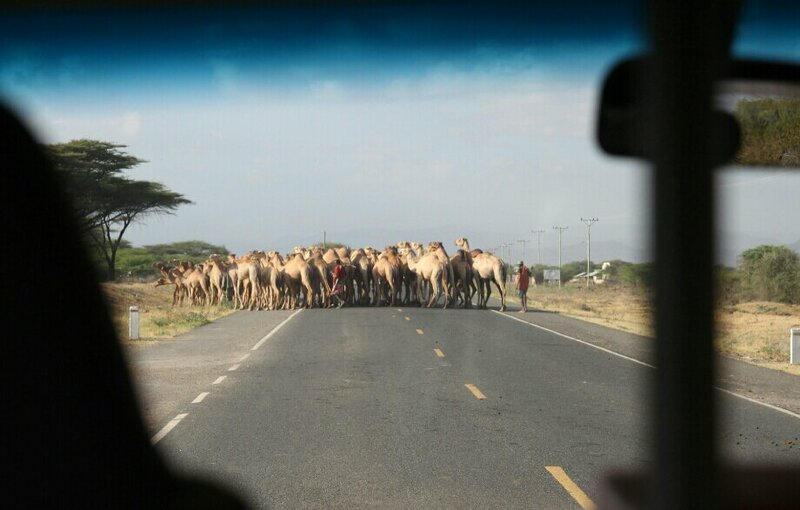 We had to stop for the camel crossing (which was fun to see) and we stopped at multiple curio shops, not of our choosing (which was somewhat less fun after the first one). In the end, the drive was mostly uneventful. We arrived in Mbweha Camp too late for an afternoon game drive, but because the camp is outside the national park, they offered a night game drive. They told us the big animals (rhinos, buffalos and cats) stayed inside the park, so we wouldn’t see them. They did promise kangaroos. We were dubious, but how can you say no to that? After dinner, Dom and I climbed into the back of a Land Rover, still uncertain what we would see. We left camp, just the two of us and two guides, and stopped within 100m and the spot light reflected a pair of eye back at us. Then the eyes started to bounce toward us and we got a view of our first (African) kangaroo. While technically a Spring Hare, it did look and move like a small kangaroo. Just as I got the camera ready to take a photo, it dropped into its hole. It was hopping along like it wanted to say hi, then it vanished. Luckily there were many more. 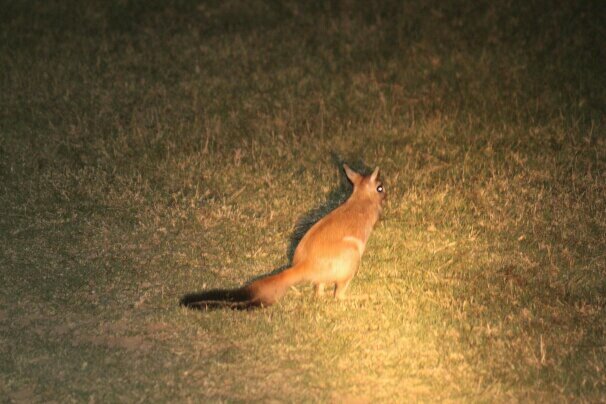 During the rest of our night game drive, we also saw Thompson gazelles, impalas, a few fox, a spotted hyena and a family of jackals. We found the jackals just as they were starting a hunt. There were five adults and three juveniles that we could see. As soon as the adults started hunting, the young ones were left behind to play in the grasses. It was fun to see them leap and tumble around. Between the jackals and the kangaroos, we could have stayed out for hours. As it was, we stretched the hour long drive to a little over 90 minutes and had a wonderful time. 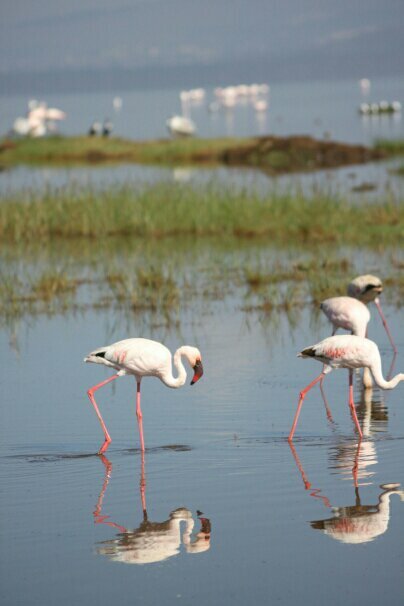 The next morning, it was time to visit Lake Nakuru National Park, famous for the flamingos. With the heavy rains over the last two years, the lake has dramatically increased in size and we had heard many the flamingos had left. Luckily enough were still around for us to see them. The park was also full of buffalo which meant we had now seen four of the Big Five. The only one left was the rhino. As we drove around the lake, we had to backtrack several times to avoid areas where the road was completely flooded. We saw a great variety of primates, including a family of baboons with a very young one, lots of sing birds and giraffes, but the rhino was hiding. Eventually we stopped and gazed across a field. With the binoculars and a bit of squinting, we were convinced there was a rhino the far side, but it wasn’t what we had hoped to see. Just before we stopped for lunch, many of the animals were hanging out in the shade, trying to stay cool. For many, this made it much more difficult to spot them. For the next rhino we saw, it made it considerably easier. At first, it looked like a boulder, but as we approached, it raised its head and we saw it was a black rhino. We were close enough for a nice photo, so I stood up and got the camera ready. Just as I went the snap it, the rhino stood up and charged the car. The rhino approached, our driver hit the gas, I flew backward and got a brilliant picture of the sky… timing is everything! Once we retreated, the rhino did the same and before I could get another picture, he was too far away. Oh well, at least we had seen a rhino and much closer than we expected. After lunch in the park, we started towards the exit. Listening to the CB and cell phone, no one had seen any cats all day. A little disappointing, but I guess you can’t see cats on every drive. We did see a Colobus monkey and a tortoise. While looking for other monkeys we saw a Verraux’s Eagle-Owl. It was sitting at the top of a tree and absolutely massive (around two feet tall). Then as we drove around a bend, another rhino was waiting for us. This one was trotting along and I had the camera ready before the driver even saw it. It walked up to the road, looked at the two cars parked near it and sauntered across. It a was wonderful to see it up close without fear that the car was about to get flipped over. A nice end to our final game drive and a friendlier sighting for the last off the Big Five. So, if Rob and I ever get a chance to go to Africa, we are totally taking you two with us because you two have the Animal Viewing LUCK! Absolutely fantastic. All we’ve seen a lot of lately are the south ends of two northward trotting dogs… Jamie is a bit discombobulated because Schubert’s people came home yesterday and he has moved out, leaving Jamie and “only dog” again. However, today he seem to be quite used to it – at least on the walk he was happy. Looking forward to seeing you two again sooner rather than later. What a great trip you’ve had so far! If you make it over, we would love to come back. It’s been great and today, Dom got to feed a giraffe. Pictures are coming, but it might take a while. See you next weekend. 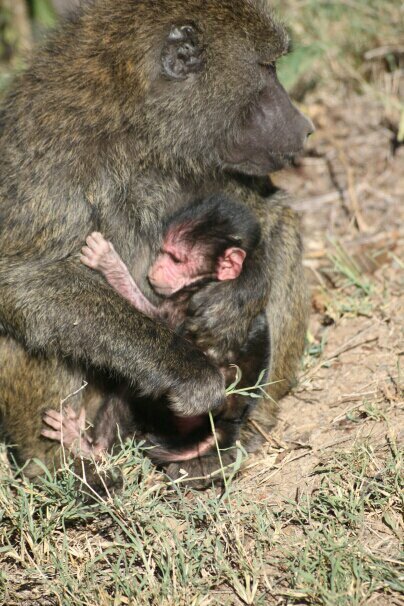 BTW, the baby baboon sure looked like a newborn! Wow, congratulations on seeing all five. Great photos. Surprised you didn’t post the nice picture of the sky, but you can save that for the slide show you narrate. We spent the day in Ensenada on a whale watching trip. Saw about a dozen greys, a couple humpbacks, plus lots of dolphin and sea lions. Nice trip. See you soon. Sounds like you’re having a great trip as well. I can’t wait to hear more when we’re both back in the country. I know. Dom thought it would make a nice pet, shouldwe get one for Sam as well? They let you bring them back to the US!?! I bet there’s a business idea there.